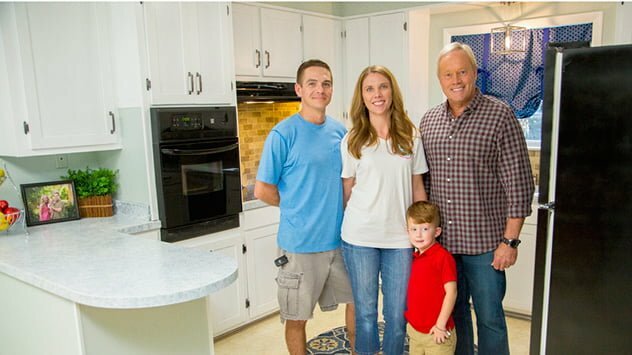 The Today’s Homeowner crew helped homeowners Nicole and Yarby fix up her grandmother’s dated kitchen. We think it’s something grandma would be proud of! Check out the Cool Kitchen Update episode article for more information and links to the products we used on this project! It sounds like you have quite a renovation planned! Please clarify: were you seeking advice or were you interested in submitting a project for the “Today’s Homeowner” TV show? Hello Danny, the project I have is a wall that separates the kitchen from the dining area. I would like to open that up so food can be passed from the kitchen to the dining table. Presently we have to go from the kitchen and the pass through a door to get to the dining table. I have a cooktop facing the wall and a ventless hood/fan/light assy above. The wall opening would be roughly 32″ wide by 16″ height. There is an outlet that is 12″ out from where the opening would start. Overall width is 48″W by 25 1-2″H. On the door side, the doorframe is 16″ in from where the wall starts. I can send you pictures of what I described to you. Hi Lilia, thanks for writing to us. We have a number of contests throughout the year, so please follow us on Facebook (todayshomeownermedia) to stay informed of those. Also, one thing we’ve always said is that a little improvement here and there can add up. Anything you can do, little by little, as budget allows, can result in an overall big change, whether that takes weeks, months or even years. We’ve seen this strategy work for homeowners a number of times. Best wishes. I wanted to ask about entering for the contest. I’m so desperately needing upgrades. I’m s single mother of 4 kids. I was married with my first 2 older children. Ex husband cheated left us. I got remarried had 2 more kids ages now 14 and 10. Never had the money to be able to upgrade. Now husband cheated on me and left us. I’m so heart broken because our plans one day was to make upgrades. My children now feel that it’ll never happen. Thank you very much for watching the show. Our 20th season is going great! I miss Allen on Shows.Where Allen? Hi, Christina. We are sorry to hear that you can’t view the video. The video is working, so please try closing the web browser and refreshing the page. Thanks for watching! There was a glitch with our server. You should be able to watch it now, Steven. Thanks for letting us know! Can’t watch it because you don’t follow up!!!!!!!!!!!!!!!!! !